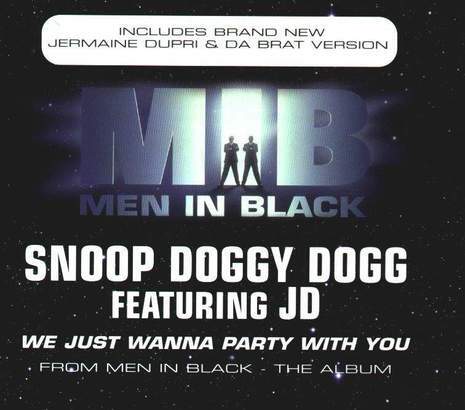 Snoop Dogg Releases Single "We Just Wanna Party with You"
"We Just Wanna Party with You" is a single from producer Jermaine Dupri and rapper Snoop Dogg that can be heard on the Men in Black soundtrack compilation album released in 1997. It is the second single release of Jermaine Dupri, besides that he produced the Kris Kross album and their hit single "Jump". His first release, "Honey" and his next release "You Make Me Wanna" charted simultaneously with the M.I.B. single. All of them were produced by JD with a short emceeing also done by him. It was the first collaboration of Snoop and JD, that was followed by "Protectors of 1472", "Bow Wow (That's My Name)" and "Welcome To Atlanta (Coast to Coast Remix)". It was also Snoop's first single outside Death Row as being a single from an album released by Columbia/Sony and produced by JD. It only had a minor success out of the United States (where it had none, only the album charted), particularly in Australia where it stayed 17 weeks on the chart until the next year leaving the top 100 on the first week of February, 1998. The song samples Kool and the Gang's 1982 hit single "Get Down on It."